Before my recent trip up to Sydney I mused on Twitter: "Is it bad that, as a Melburnian, the only thing I really want to eat up in Sydney is Thai food and Zumbo/Bourke St Bakery pastries?". I'll be writing up the Thai restaurants I visited in a separate post, but for now here's a collection of other culinary highlights from the four day trip. 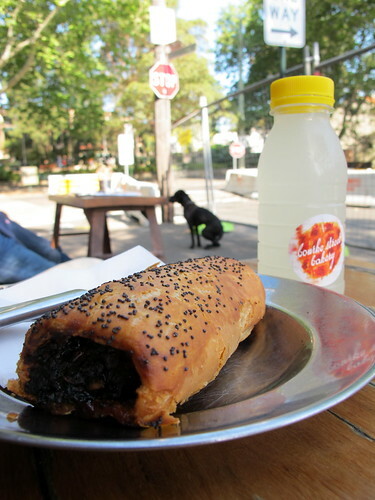 I revisited Bourke Street Bakery because I'd liked it so much on my last Sydney trip. On that occasion I'd tried the pork and fennel sausage roll and a strawberry and vanilla brulée tart. I was VERY temped to get the pork and fennel again this time, but in the interests of variety for the blog I tried the lamb, harissa and almond. 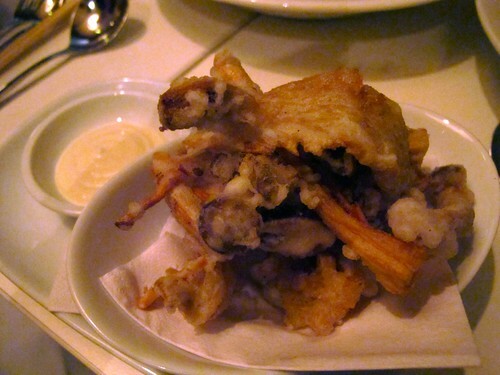 Also excellent, with pastry to die for. 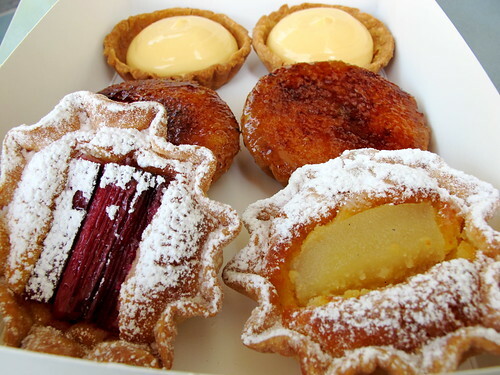 My Sydney hostess, the gorgeous Miss C, was inviting some of her friends around for drinks that night so I bought a box of Bourke Street Bakery tarts for us all to share: lemon curd, strawberry and vanilla brulée, almond/pear and almond/rhubarb. I bought the Bourke Street Bakery cookbook but haven't made anything out of it yet - can anyone recommend a good starting point? 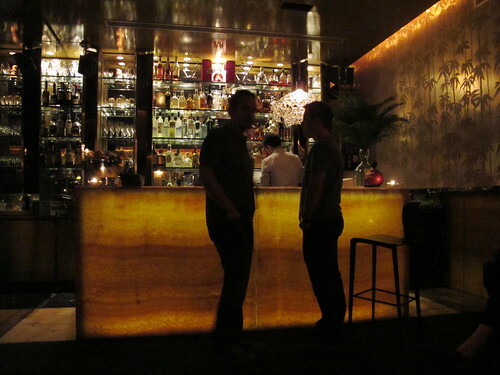 Later that night I taxied over to Potts Point to meet my friends Beatch, C and C for cocktails then dinner at Lotus. Lotus had been described to me as "modern Asian, ballsy flavours, a great cocktail bar at the back and just generally great for city fringe wow factor". After knocking back a rhubarb sour and a cucumber martini in the back cocktail bar, we were seated in the main dining room. Because one of our party was a pescatarian, we decided to construct our own seafood degustation from the selection of medium sized dishes (no entree/main divides here) - with the exception of The Cheeseburger, which we three omnivores were keen to try. No decent photo of The Cheeseburger I'm afraid, and I apologise for the poor quality of these other photos: it was nightmare food blogger lighting! 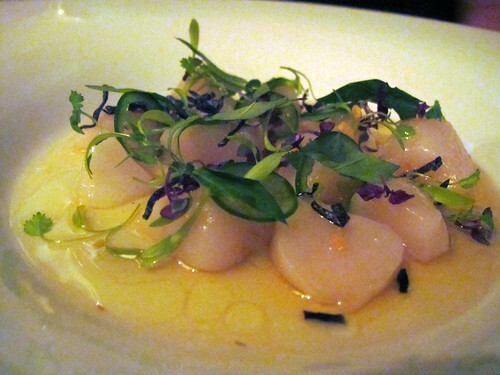 We ordered lots of dishes, these are just a few highlights: Vietnamese inspired sea scallop ceviche ($19, possibly my favourite); tempura of Japanese mushrooms with yuzu aioli ($16). 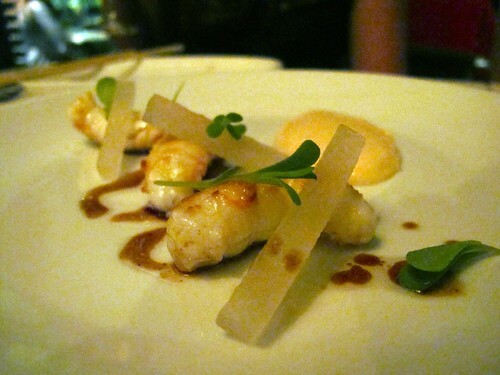 Seared scampi, foie gras (okay so technically not pescatarian), nashi pear and hazelnut oil ($24); local asparagus, spanner crab, fried egg, tartare sauce ($18). I also really loved the steamed fish with silken tofu, mushrooms and kimchi consommé. 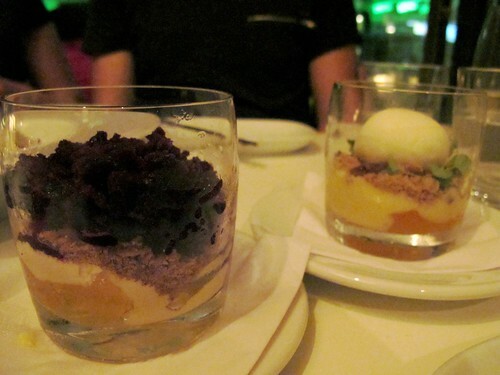 The desserts ($15 each) were also top-notch: blueberry granita, sauternes custard, peach ice cream and elderflower jelly; passionfruit custard with chocolate meringue, streusel and yoghurt sorbet; and a warm choc chip cookie with vanilla ice cream, raspberries and drizzled butterscotch. DROOL. Saturday was the day when a group of us would be spending the afternoon on a sailing catamaran cruising around the harbour celebrating Beatch's 30th brthday. I got up early to run a number of errands. 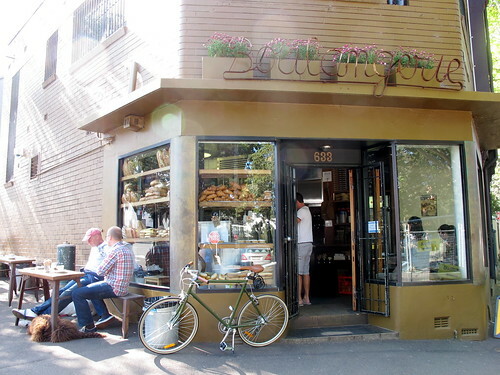 Stop one was Rozelle for Zumbo macarons. 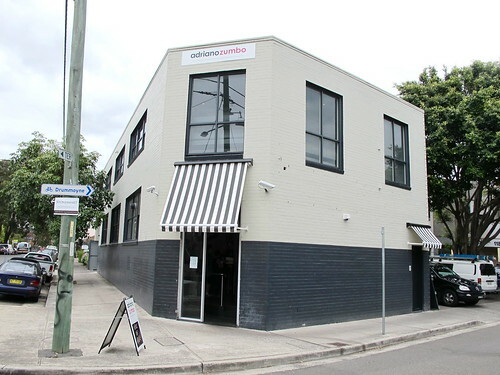 Since my last visit to Sydney, Adriano Zumbo has closed his Cafe Chocolat in Balmain (still maintaining the original Balmain pâtisserie) and moved cafe operations to a site in Rozelle with adjoining kitchen. 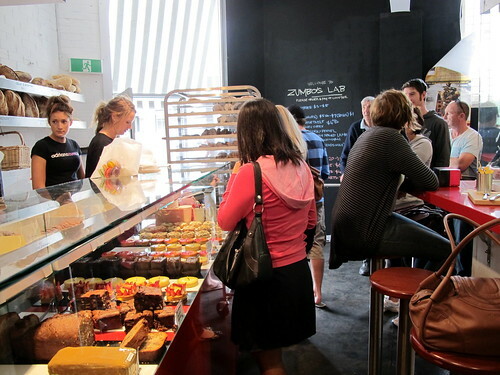 When I mentioned I wanted to go and get Zumbo macarons for Beatch on the Saturday morning, every Sydneysider I spoke to sucked in their breath, shook their heads and said I'd be insane to try visiting on a Saturday morning. A.Zum was hot property BEFORE all the Masterchef macaron tower/V8 cake hoopla took place, but now his popularity has gone mainstream. I hope the rumours that he's expanding to Melbourne are true, and that he settles on a site soon. He does seem to be visiting Melbourne a lot more these days. Anyway, as it turns out, I only had to wait a few minutes to be served. Result! 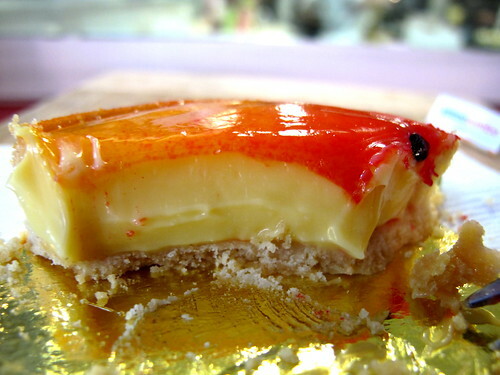 While I was there I couldn't resist getting one of those exquisite passionfruit tarts. The main cafe area is upstairs and is yet to open, so right now there are just ten stools by the counter. 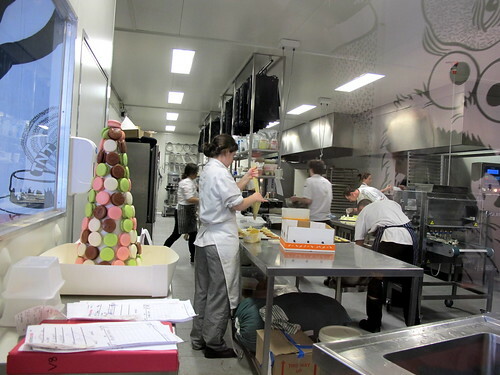 They afford a view through a window into the kitchen, where I spied a Zumbo macaron tower in its native habitat. A macaron cornucopia! I'm afraid I don't remember all the flavours, but they included rose, pistachio & apricot, finger bun, raspberry & dark chocolate, pineapple, blackened vanilla (the purple ones), Mont Blanc, orange choc, passionfruit and - bizarrely - caramel hommus (the orange ones in the centre). CARAMEL HOMMUS! Later on I shared one with Beatch and he and I agreed that it tasted exactly like it sounded - caramelly but hommussy. I award A.Zum a merit badge for creativity, but I feel that rather than being a brilliant new combination it was merely the sum of its parts, nothing more. Stop two was another site I've visited in the past: the Sydney Fish Market. I wish I'd had time to stay and browse like I did last time, but I had a boat to catch! 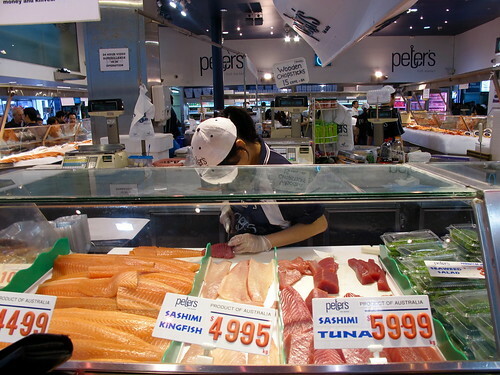 So I marched on over to the sashimi stand to buy a ridiculous amount of fresh fish. 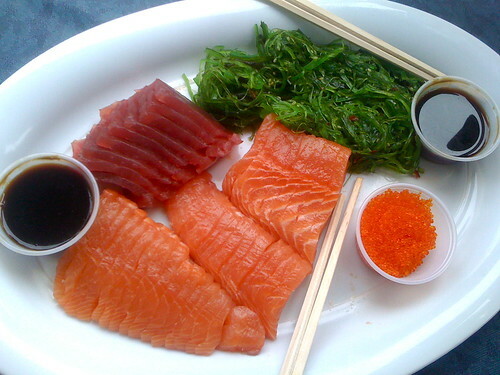 Once on the boat, I arranged it on a platter with a serve of roe and some seaweed salad and it was devoured by an eager mob. 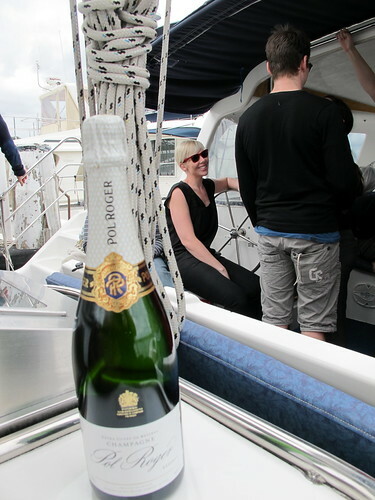 Stop three was just before I got on the boat: I asked my taxi driver to wait while I dashed in to a bottle-o to grab a bottle of Pol Roger. We had a lovely time on the harbour, even if it WAS a little overcast. 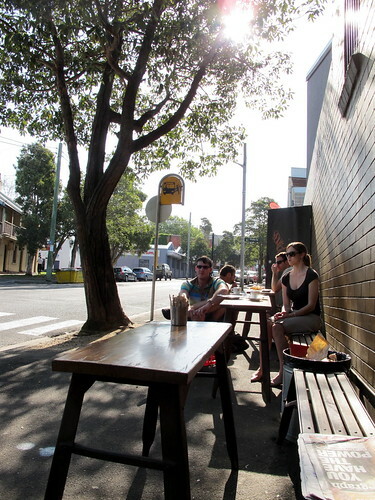 After the cruise I went back to Surry Hills to catch up with the lovely Mel (aka Fooderati). 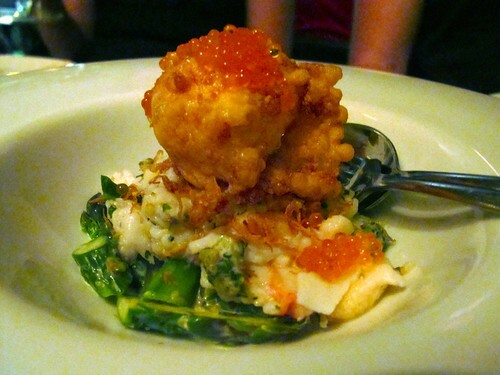 We met up at Cotton Duck, a restaurant that just opened a few weeks ago by Jared Ingersoll (of Danks Street Depot fame). 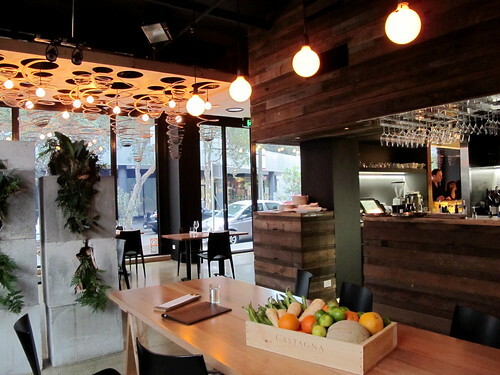 The sustainable eating focus of the menu is echoed in the fitout of the restaurant, which features lots of salvaged and recycled materials. I drank another rhubarb sour (clearly THE hot new drink in Sydney this spring!) 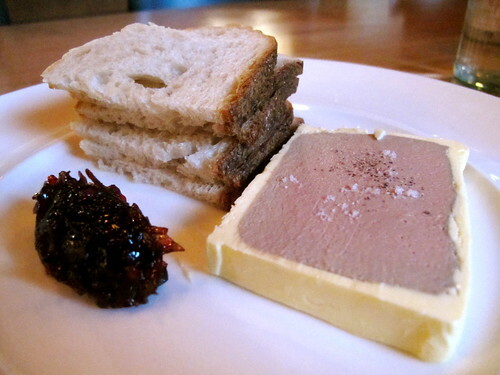 and we shared a rather lovely duck liver parfait with rosella relish. 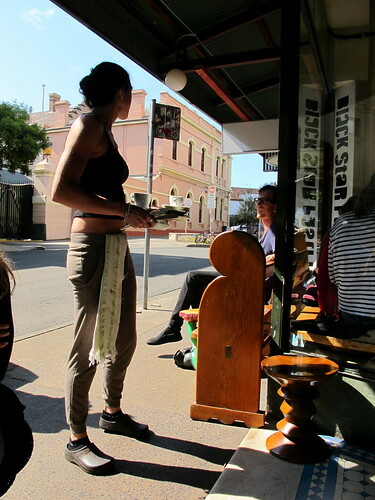 On my last morning in Sydney, Miss C took me to her local, Black Star Pastry in Newtown (located next door to noted restaurant Oscillate Wildly). 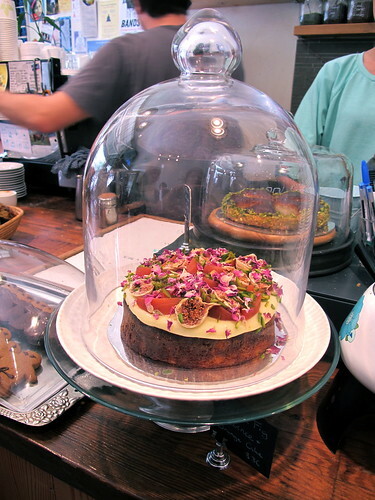 How crazy-good does Black Star's orange cake with Persian fig and quince look?? 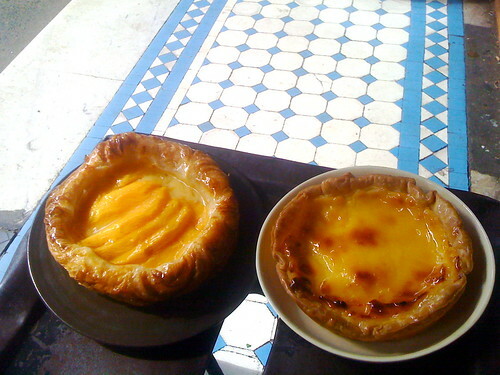 Miss C and I shared a mango danish and a Portuguese custard tart. We never seem to see mangoes in danishes here in Melbourne - can we please make them a thing for this summer? They taste brilliant. Last venue! 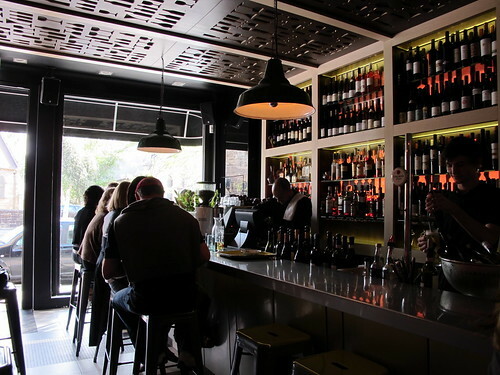 Prior to heading to the airport I spent an hour with Beatch, C and C at a fabulous little wine bar at the end of Oxford Street, called The Wine Library. 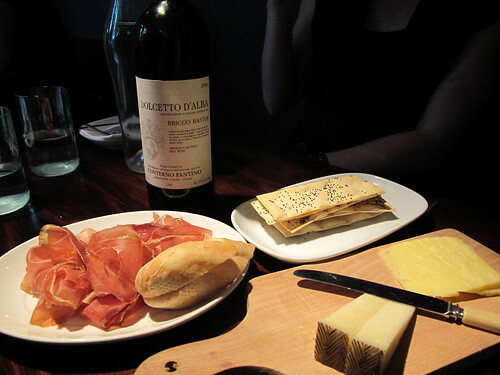 We sat next to the custom-built charcuterie case, drank a couple of bottles of Italian red and nibbled on cheese and jamón. A perfectly civilised end to a raucous, decadent long weekend. On a recent trip to Sydney my husband and I tasted our first macarons (as well as lunch and little cakes) at La Renaissance Café Patisserie (47 Argyle Street The Rocks Sydney). All was amazing, however the macarons were the best we have tried to date. 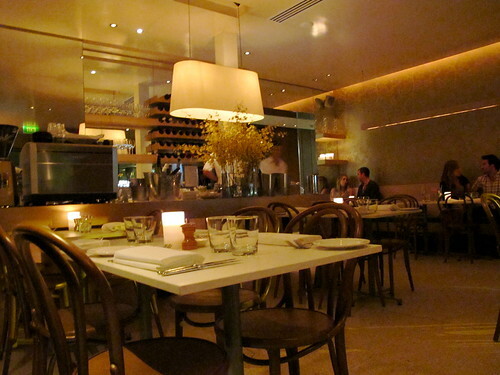 A place well worth while next time you're in Sydney if you have not already been there. RE: the Bourke St cookbook - the dark chocolate and raspberry muffins are to die for and super easy. 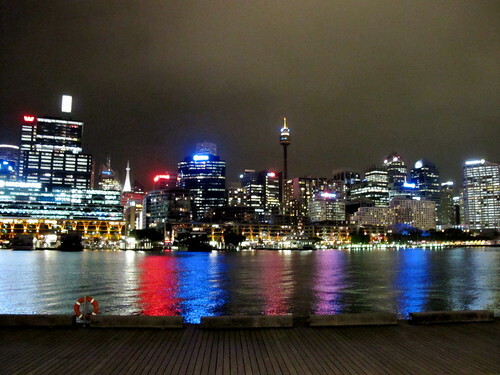 Ok very jealous of this trip to Sydney. Particularly the fish market - and the harbour cruise. For me, Sydney is also all about those cheapo Thai restaurants with the dodgy names like Thai-riffic and Thai-tanic. Love them. Oh wow.. 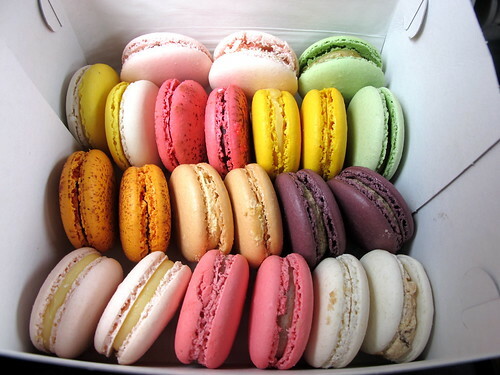 I'm so jealous you had macarons! From ZUMBO!!! Agree with Gourmet Chick. Sydney's cheapo Thai restaurants have a taste all of their own, just like country-town Chinese, and I miss them. 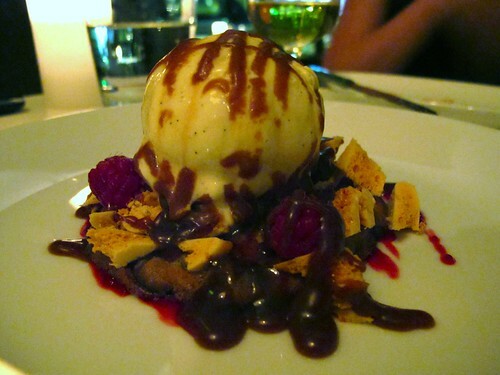 It sounds like you had a wonderful time eating your way through Sydney! With the Bourke Street Bakery cookbook, I recommend starting off with the ginger chai tart. It was divine! We also tried a couple of pies and the lamb and harissa sausage roll. Apparently it was very time intensive (my partner made it), but the batch (frozen) lasted for many a delicious dinner! u sure did pay visit to A LOT OF places to eat =P. envious! NO FAIR, A ZUmbo macarons. 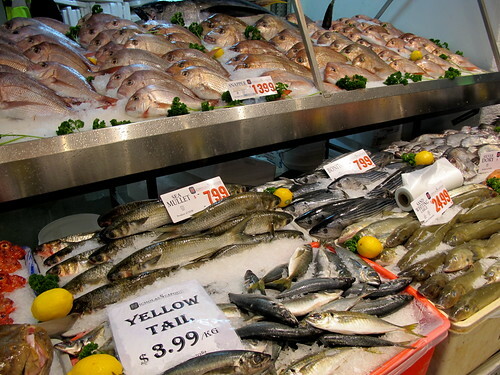 and why o why don't we have such a fish market in melbourne...sigh. Thanks to all of you who recommended particular recipes in the BSB cookbook! Will try one of them next weekend. Thanks ADITB and BSC for the macaron tip for La Renaissance. 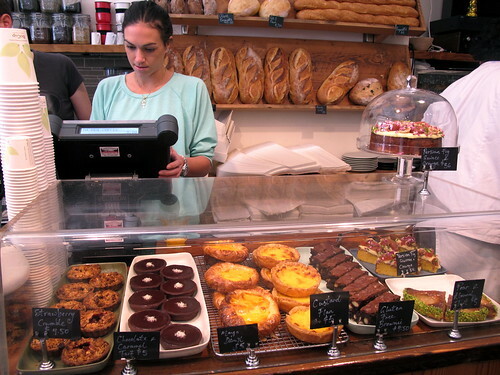 Is La Renaissance that old school, ultra-Frenchy patisserie in The Rocks? I think I've been there before and enjoyed a quiche. Gourmet Chick and Ali-K: just drafting my post about cheapo Thai places now... sigh. And yes, almostalwaysravenous, SO jealous of the Sydney Fish Market! I have stumbled across your blog so many times and love it...this time I remembered to add it to my 'Follow' list. I am so jealous that you got to Bourke Street Bakery...I think I would go from Melbourne to Sydney just to go there...but then looking at all the other places you went I would have to add many more 'must go to' to my list. and the muffin recipe is on there for anyone without the book...although I recommend adding that book to your shelves! Nice work, a fab cross section of awesome places visited. Sorry I couldn't manage to catch up with you!